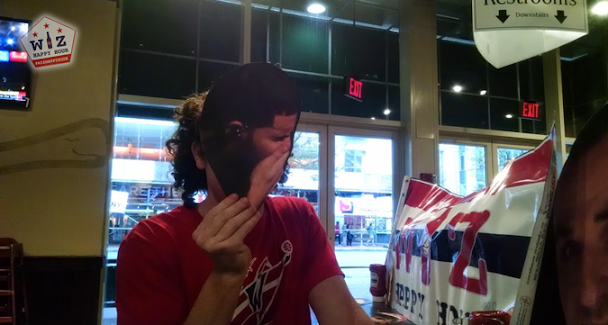 While Washington Capitals fans were gathering inside the Verizon Center for a jumbotron watch party (I've seen 0 pictures from this, did people actually show up?) 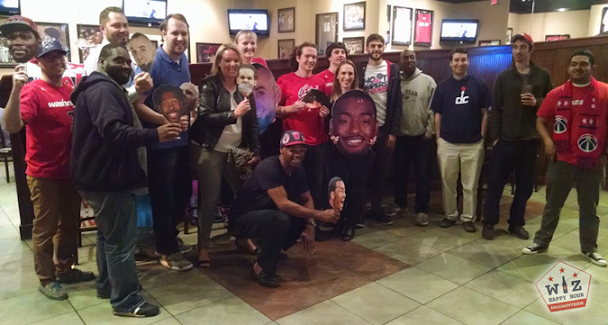 Washington Wizards fans were gathered just outside at the Greene Turtle to watch the Wiz lay the smacketh down on the Toronto Raptors. If you have been a DC Sports fan in the DC area for the past several years you know how hard it is to get a bar to put on a Wizards game. You typically have to beg them and bribe them just to get a 4 inch tv in the corner changed to the game. And when the Capitals (who have lower ratings than the Wiz) are on, it feels like 90% of bars go Caps crazy. Well Greene Turtle did something that several bars would probably refuse. They put on the Wizards game audio instead of the Caps playoff audio. And Guess what...Wizards fans showed up! Shocking! This was one of the most random crowds that we've ever had at an event. There was some word on the street the Turtle was playing the Wiz audio so fans who never even heard of Wiz Happy Hour showed up. And it was awesome. We even had 2 fans from Holland show up. The one guy wakes up at 3am to watch the Wizards live from home. He was a bigger fan than most Wizards fans that come out and he lives a billion miles away. It was pretty cool. While we had our eyes on some side TVs with the Caps and Nats, the focus was on the Wiz Kids. And as we've been saying all year, you can't beat watching the game with other fans clapping and cheering and high fiving.